The two actors, Nathan Keepers and Darius Pierce as, respectively, brothers Nat and Dirk Boon agreed (after much vehement disagreeing) that they were truly identical twins deep, deep, deep, deep, deep, real deep down. Darragh Kennan stands in The Comedy of Errors set at the Folger Theatre. 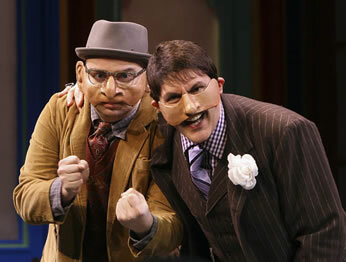 Below, Darius Pierce as Dromio of Ephesus, and Bruce Nelson as Antipholus of Ephesus wearing masks, the standard device of the fictional Worcestershire Mask and Wig Society. Photos by Carol Pratt, Folger Shakespeare Library. This was not simply a performance of Shakespeare’s play but rather a production of the Worcestershire Mask and Wig Society’s performance of Comedy of Errors: Shakespeare inside a Waiting for Guffman framework. Director Aaron Posner, in an after-show talk, reasoned that this play is like Taming of the Shrew as both are among The Bard’s earliest works and devoid of any deep meaning. Shakespeare himself gave Shrew a play-within-a-play framework, so why not do the same for Errors? The easy answer is that Shakespeare didn't see the thematic need to do so, as he did for Shrew. Posner, however, further saw this framework as a way to explain the production’s use of masks, allowing actors of not only different appearances but also different statures to play the Antipholi and Dromios. Yet, Posner's own use of masks in Two Gentlemen of Verona and puppets in Measure for Measure, both at the Folger, needed no such declaration to be effective. More to the point of good theater is whether the framework device worked in its own right: not wholly. Any time you play with Shakespeare’s structure you incur consequences and often sacrifices. Most glaring in this production was the fact that the touring WMWS troupe was so small it had to double many roles, namely those of Angelo with the Duke (Matthew R. Wilson) and the Second Merchant with Egeon (Stephen D’Ambrose). In some barely funny stage business, the two actors, trying to stay in character as Angelo and the merchant, made up an excuse for watching Egeon’s anticipated execution from a more private place and ran off the stage disrobing in order to come right back on as the Duke and Egeon. This meant that two characters key in the Circe’s cup chaos of the last scene are absent, requiring some rocky line cuts and an overall tapping down of the cacophony that so bewilders the Duke. However, the scene ultimately worked because of another blurring of the inner fourth wall. Rachel Zampelli played WMWS actress Mickey Mercer as a ditzy party girl playing the Courtesan, cluelessly trying to comprehend the plot unfolding around her. Rather than the Duke being moved to distraction by chaos, he was distracted by the Courtesan’s (or Mercer’s) flirting. Whether it was the Duke or WMWS actor Mycroft Smalls being distracted didn’t really matter; it was funny in both dimensions. Posner said he toyed with making the actors play the play poorly, but that would have made for a grating night of theater, so other than the Courtesan, he wisely unleashed the real actors’ talents in the playing of Shakespeare’s roles. Thus, we got Wilson’s Duke genuinely caring for Egeon; Darragh Kennan as Antipholus of Syracuse proving that this play does contain some grand poetic moments in both his assessments of Ephesus and in his wooing of Luciana (Erin Weaver, ever perky but still as headstrong as her sister); Suzanne O’Donnell as Adriana making a spirited, rambling fifth act appeal to the Duke, all from her knees, elevating this comic set-piece to an aria that inspired audience applause; and Bruce Nelson as Ephesus’ Antiopholus managing to find a sympathetic reading in what’s usually presented as a hot-headed brat. Nelson also did a memorable turn as Timothy Tushingham, artistic director of the WMWS, introducing the production with a video documentary of the society rehearsing Comedy of Errors. The film included interviews with the WMWS actors (along with Folger staff playing themselves) and provided one of two great Dromio moments of this production—ironically, neither moment Shakesperean in origin. In the video, the two actors, Nathan Keepers and Darius Pierce as, respectively, brothers Nat and Dirk Boon agreed (after much vehement disagreeing) that they were truly identical twins deep, deep, deep, deep, deep, real deep down. 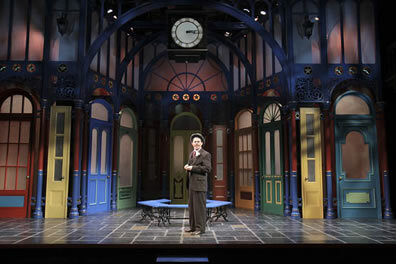 The other great Dromio moment came in the play itself, inspired by the Folger’s famous Elizabethan-style gallery stage with its two prominent pillars (infamous to directors and designers). Scene designer Tony Cisek built a seven-angled wall comprising 11 brightly colored doors. On one of his exits, Keepers as Nat Boon as Dromio of Syracuse opened a door and rammed gab-mask into the pillar hidden behind. “Why is that there?” he wailed. When heading into the abbey in Act 5, this same Dromio opened a door to a collision with the other pillar. “There’s another one!” he yelled. Shakespeare may not have written this bit of stage business, but I’m sure he would have appreciated this inside joke at the Folger's expense.